Lying in the middle of a sidewalk or lawn. Another uprooted and destroyed flower. I’m impressed. It takes real skill and courage to hunt down and defeat a flower. One person adds some color and life to a property. Another one ruins it. Years ago. A muggy summer night. A beefy, sweaty troglodyte swaggers towards me. He grabs a carnation from a downtown bank’s flowerbox and throws it on the concrete. After making his point, he walks by me without a word or even a grunt. He’s a man, not a pansy. He had contacted someone about the problem and was waiting for action to be taken. I didn’t have a chance until yesterday to check out the PHS entrance. Anyway, I wanted to give the school and the city the opportunity to fix the problem. As you can see from my photos, the PHS entrance is indeed a bit weedy. I wouldn’t compare it to a ghetto high rise but it could use a decent trimming, especially with the milkweeds growing around the entrance sign. Anyone got a weed-whacker? It’s time to cut down unsightly plant growth. One would think the city - or at least business or property owners - would fight off the jungle. Plattsburgh Pride: It’s All In The Details. So don’t whack off: whack weeds. So far the renovated front entrance to the public library has held up. No more crumbling steps. But now each post of the center railing is corroding away around the base. Maybe it’s from all the salt put down in the winter to keep the stairway clear of ice. According to one theory an ingredient in the new concrete (lime) is doing the damage. Either way, it’s time to think about fixing the rail posts. Or just let the rail fall over. Then it will cost more to repair. I’m trying to ID these flylike critters. They act like bees, tapping flowers for nectar, flying from bud to bud. Any entomologists or bored reference librarians out there who could help me? …by expecting the city to do squat for another year regarding shrubbery blocking the sidewalks. And to those property owners who do trim back their hedges – Thanks! Tuesday evening. June 10, 2008. A hell of a thunderstorm hits. After it passes, the setting sun produces a yellow sky in the west, a double rainbow in the east. He’s something of a legend at the New York State Fair. Every year he shows up to dance. When there’s a free concert, it doesn’t matter if Johnny Rivers or Blue Oyster Cult is playing. 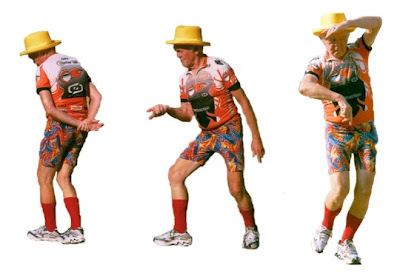 The Dancing Man interprets the music in his own way. Maybe this can be called a case of heartworm. I’m downtown, minding my own business. Glancing up, I notice the clouds look like they’ve been painted in the sky. I take out my camera and try to capture that impression. Really. And you are…? Homeland Security? Worried that I’m a terrorist casing the heavens, getting ready to blow up some clouds? Me, I’m aimed at the sky. But these clowns point their cameras right into someone’s apartment window and no one is bothered? Signs are important to point out stuff, legal warnings or helpful directions. Unfortunately signs have a rough life in Plattsburgh. Very localized tremors knock them over during the night. Here’s a new signpost downtown. I wonder how long it will last in this state. What a surprise to see such an addition since the City of Plattsburgh says it has no money. Then again, it was paid for with grant money. Too bad the city can’t get some grant money to fix this growing ashtray in the middle of Margaret Street before someone pops a tire or breaks an ankle. Final score: 5 to 1. Thursday evening the Plattsburgh Common Council shot down a proposal by a group of residents on the former air force base to make a street in their neighborhood one-way. One of the leading proponents of the change is Luke Cyphers, a sports magazine writer who moved to Plattsburgh seeking the small town life. Mr. Cyphers, welcome to the Burgh. The street in question is called the Oval, a mile long circle on the old base. Cyphers laid out his reasons for the change in an opinion piece published Friday, June 6, 2008 in the Press-Republican’s Editorial section. He was responding to an editorial by the PR that disfavored the idea. Cyphers and his neighbors wanted to change the Oval to one-way so that the inner lane could be opened up for non-motorized use, i.e., walkers and cyclists. He stressed the benefits of promoting exercise through a safer location. Apparently Cyphers has never taken a visual survey of the locals. Endomorphs, not mesomorphs, are the majority. Former mayor Dan Stewart proposed the opening of a Kripsy Krème doughnut shop downtown. Cyphers would be better off advocating that fat proposal for the Oval. Successful lobbying is assured. Obviously Cyphers hasn’t dealt with too many of the provincials around here. Advising the typical Burgher to use common sense is akin to telling a dead man to work out more often at the gym to stay in shape. If Cyphers stays here long enough, he will learn. He will learn that he should’ve moved to Burlington. Nighttime. Walking along when something in the corner of my eye grabs my attention. A black and white video monitor in someone’s front window, facing towards the sidewalk. In another window a sign informs me that I’m being recorded. This is what it has come to. To protect his property a Plattsburgh resident has to install a home surveillance system to keep an eye on things during the hours of darkness. So if I walk by this particular house, I’ll be recorded. OK, fine by me. I’ll just make my image of me being imaged. I can’t see into the residence. I don’t want to. I just want to document how acts of vandalism and break-ins around the city have put some people on edge. Maybe home surveillance systems will be popping up all over like satellite TV dishes. All images taken Sunday evening, June 1, 2008. Trashcans like this one ignore a basic problem: gravity. Your tax dollars at waste – with waste.